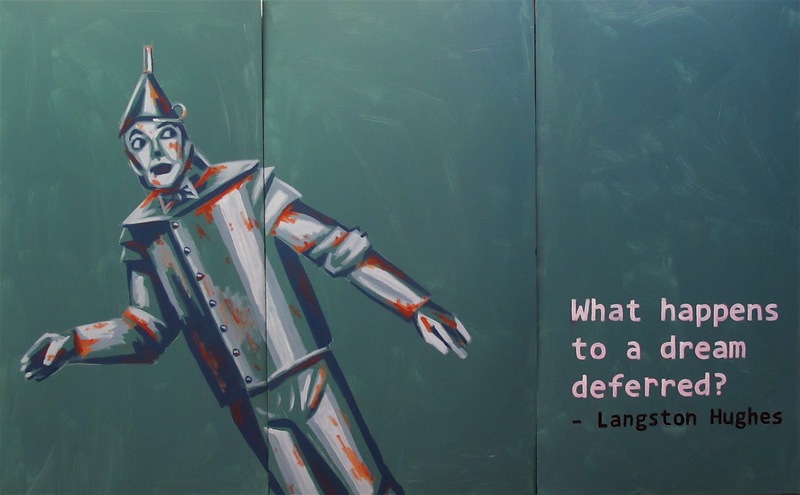 What would Kansas be like without Langston Hughes, William S. Burroughs, or The Wizard of Oz? What would Kansas be like without art? That’s what the blog Imagine Kansas Without Art is considering, in light of Governor Brownback’s order to eliminate the Kansas Arts Commission (which, if approved by the state legislature, will go into effect in July). One answer, oddly, is the Kansas described by L. Frank Baum in The Wonderful Wizard of Oz (1900). People associate Kansas with Oz, and think of Dorothy (portrayed by Judy Garland) saying, near the 1939 film’s end, “There’s no place like home,” and “If I ever go looking for my heart’s desire again, I won’t look any further than my own back yard. Because if it isn’t there, I never really lost it to begin with!” But in the book, Kansas is a bleak, grey place. Sure, Baum was describing South Dakota (where he lived) when he described Dorothy’s home (he hadn’t yet been to Kansas). But Kansas doesn’t come off as very appealing: “The sun had baked the plowed land into a gray mass, with little cracks running through it. Even the grass was not green, for the sun had burned the tops of the long blades until they were the same gray color to be seen everywhere. Once the house had been painted, but the sun blistered the paint and the rains washed it away, and now the house was as dull and gray as everything else.” Indeed, in Baum’s version, the state of Kansas is nigh killing Uncle Henry and Aunt Em. She had been “a young, pretty wife. The sun and wind had changed her, too. They had taken the sparkle from her eyes and left them a sober gray; they had taken the red from her cheeks and lips, and they were gray also. She was thin and gaunt and never smiled, now.” And, as for her husband, “Uncle Henry never laughed. He worked hard from morning till night and did not know what joy was. He was gray also.” In sum, Kansas — according to Baum — is such a grey place that it turns its people ashen and full of despair. Dorothy’s journey to Oz — which, in the novel, is a real place (and not a dream) — is an escape into color, adventure, and art. Kansas without these things is, as Baum wrote, “dull and gray.” That appears to be Governor Brownback’s vision for the state. But even an stronger rationale than the economics argument is this: life without art is bleak. Image from Imagine Kansas Without Art.